Do you have dull or broken tools? Dew Tool can regrind to Original Manufacture Specifications (OMS). 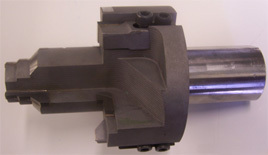 We can regrind drills, including carbide, reamers and step tools. All cutting tools that come in for regrind get inspected before evaluating whether there was any other cause for breakdown or failure besides normal wear. We can also grind special points, such as High Crown Helical, Bickford and Racon. Nothing tells us more about your tool than the microscope. Our ability to analyze tool wear under magnification, gives us better information, and you, better tool performance. Request a quote or call us at 414-571-2600 to have your dull or broken drill, reamers and other cutting tools repaired.